The fiestas for Sant Antoni, patron saint for farm animals, are held around January 17 in a great number of towns of the island. Sa Pobla is one of the towns where Sant Antoni is celebrated most intensely. According to Alexandre Ballester, official chronicler of the town, the event is twofold: religious and profane. Religious because of the devotion to the patron saint of animals. And profane due to its festive elements (bonfires, drums, wildness...) which are common in many Mediterranean cultures that celebrate the winter solstice. The preparations begin with the collection of fire wood from the property of sa Llebre for the bonfires that will warm up the "Revetlla" of Sant Antoni, the witching night with devils and "ximbombades" (special percussion hand drum). 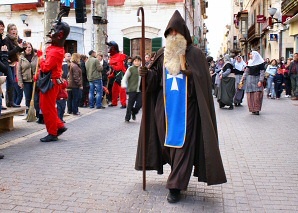 In the afternoon, there is a street parade with the participation of devils and Sant Antoni. At 7 p.m., outside the Town Hall, there is a representation of the historical ceremony of the opening of the Sant Antoni evening. Then the mayor, councilmen, other authorities and guests walk to the church accompanied by the big-heads, the giants, the devils, Sant Antoni and the drummers and devils of Albopàs. During the "Completes" solemn Mass, the joys of Saint Antoni are sung and the "Clamater" makes a speech that ends with a "Visca Sant Antoni!". Back in the square, the devils and the big-heads perform traditional dances accompanied by the music band of sa Pobla. Dances are followed by the musical firework display and by the the gathering of singers and "ximbombers". Then a procession to the Market Square takes place, where the big-heads dance and the Albopàs demons perform their fire show. Later, people cook sausages and meat at one of the many bonfires or have dinner at home with their guests. The special gastronomy for these days includes amongst others "coca" with vegetables and "espinagada" with cabbage or eels. The evening is prolonged until very late with songs and "ximbombades" around the bonfires. The day after, January 17, day of Sant Antoni, in the morning there is a street parade of bag-pipers, a Mass with traditional dances by Marjal en Festa in the parish church and another dance by the big-heads in the square. In the evening there are more activities: the traditional blessing of animals, a parade of floats and traditional dances by Ballada Poblera.